Note: This was posted in April 2011 in my Posterous blog. After Posterous was shut down, I resurrected this post on April 25, 2015. It is amazing how some things have success written all over them. It is one of life’s pleasures to fondly remember, through hazy memories, how a certain place or people there used to be in the good old days. I indulge in such a pleasure quite often. It however is a special joy, an oddly humbling joy, to see how a certain event or phenomenon that one started has grown to be bigger than what one ever imagined. I am talking about an event I co-founded with 4-5 other friends when I was a student at Stanford University. We were volunteers in the Stanford chapter of Asha, a non-profit organization focused on child education in India. A constant pre-occupation of our small group was to raise funds by organizing various events (those funds would then support NGO-run education projects). 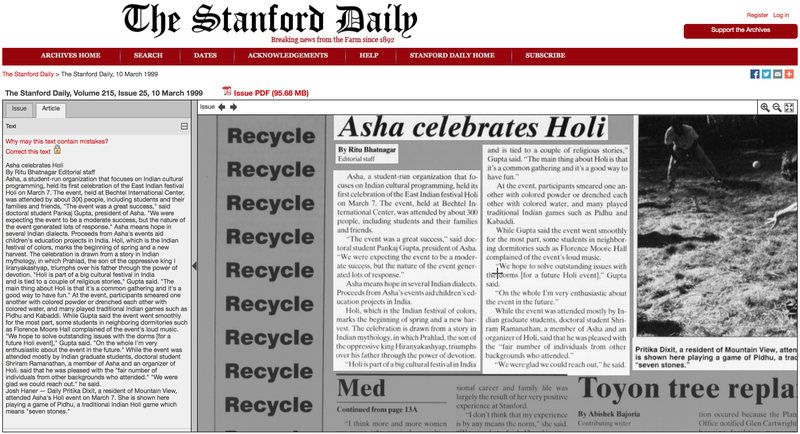 The event we decided to celebrate on one fateful evening of 1999 was to hold an event on-campus to celebrate Holi, the festival of colors. On March 7, 1999, we were expecting 50 people to show up. We got 300. We raised perhaps $2K. Yesterday, I went with my wife and our not-yet-2 year old son to the same event, now run by a new generation of volunteers, definitely half a generation younger than me. There were probably 5000 people there, the event was sold out in advance, and I would guess $50K might have been raised. Me and my friends of 1999 have reason to be pleased. I was feeling proud and dug up some old documents and links from that fateful spring 12 years ago. I distinctly remember saying to the group that we should do some event for Holi. There were a few events to celebrate Holi in the bay area, but none really fun. None of them provided water, or even colors to play with. Our group spotted an opportunity. We decided that here was the time to be really different and provide what no-one else could: water, colors, and a fun and young crowd to play Holi together with. Any feeble protestations of logistical difficulties must have been dismissed, for I do not remember them. We had nothing to lose, and set up the event in the Bechtel International center, hoping 50 people would show up. We took the necessary permissions for colors, water and food. We got up that morning of March 7th 1999, nervous of not knowing how this would turn out. Somehow help arrived in the form of new volunteer faces. And then students started showing up. And then more and more showed up. We ended up counting close to 300 and had such fun that I remember we declared the event to be a smashing success to ourselves and counted every dollar of the $2000 we had just raised for Asha. Sadly, no images survive on my computer. However, an article was carried by the Stanford Daily the next day. (The Stanford daily URL has been known to be flaky, so here is the screenshot as well). From that point on, there was no looking back. It was immediately clear to us that we could make this big if we spent more effort on it. We immediately moved it out of Bechtel and into Wilbur Field, and prepared for 500 people the next year. Well, 1000 people showed up and there was no looking back in subsequent years. This became the single biggest fund-raising event, and by a huge margin, for Asha Stanford. Fast forward 12 years. Kudos to new generations of Asha volunteers have taken this event to completely new level. Year on year, the event has gained strength and people. There is hardly any Indian in the San Francisco Bay area who has not heard of this event. Here are a few videos of the event. Obviously, the magnificence of the event now has nothing to do with me or the small Asha group in 1999. The event might as well had petered out. But it did not (another event, us showing world cup cricket in a shared area, did die out). Full credit goes to passionate volunteers for progressively taking it to the next level. Still, I reckon I might be pardoned for feeling self-pleased. I am very very humbled and very very proud that our legacy lives on, in a form that was never imagined by that small group of volunteers in 1999. Update on April 25, 2015: The Holi event has continued to increase in popularity. It is now celebrated at Stanford on two consecutive days and also by the Asha chapter in San Francisco. I just attended the latter today and tweeted this live stream of the event. This entry was posted in Uncategorized by pankajgupta15. Bookmark the permalink.